Every month we are featuring one pet on our Facebook cover photo and website. 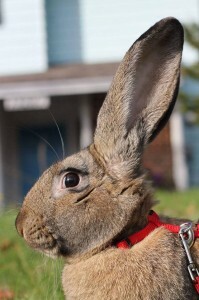 May’s Pet of the Month is Thumper! Thumper is a 1 year old Flemish Giant X. He was adopted from a farm and now lives a luxurious life that includes going to rabbit agility on Sundays at the Vancouver Rabbit Agility Club. His favourite treat is a frozen strawberry and he loves to cuddle! Thanks for reading! Keep an eye on our Facebook page later this month to nominate your pet for June’s Pet of the Month.